I have watched the clock tick over as I sat here wondering how to begin. A long absence has spun cobwebs in my brain and remembering how to write and how to begin feels like learning to walk after months spent in bed; incredibly foreign and daunting. Perhaps I should start by way of explanation; I was not the cause of the extended break in transmission, rather an error on behalf of our internet provider is where the blame solely lies. What was meant to be two weeks without the information highway whilst we upgraded our plan, turned into over six weeks, making me feel as though I was shut away in some cabin in the middle of nowhere, against my will. At first I struggled with the lack of email, weather checking, blog reading and Facebook updates, but eventually, as with everything, I became accustomed to my technologically-reduced life. So accustomed in fact, that when my husband informed me the internet had finally been restored, it didn't even cross my mind to check my email, as I couldn't even remember I had one as I had instead kept in touch with friends and family by phone only for those six weeks. I had to rack my brain to remember which sites I liked to visit and what I needed to perhaps, catch up on. So I have begun with a recipe that I made and photographed during the pre-blackout era, and I will endeaveour to get back into the swing of things and resume my regular weekly posts as well as catching up on all of the lovely blogs I follow as quickly as possible. Have you taken a break this year, whether voluntary or due to circumstance? Pulse together all crust ingredients in a food processor just until mixture resembles coarse crumbs. Put tart pan on a baking sheet and press dough evenly onto bottom and up side of tart pan with your fingertips. Chill shell, covered, on baking sheet until firm, about 30 minutes. Put oven rack in middle position and preheat oven to 170°C. Line shell with a buttered sheet of heavy-duty foil (buttered side down) and fill shell one third of the way up with pie weights. Bake (on sheet) until edge is pale golden, 20 to 25 minutes. Carefully remove pie weights and foil, then bake until edge and bottom are golden, about 20 minutes more. Cool completely in pan on a rack. Beat cream cheese in a bowl with a handheld electric mixer at high speed until smooth, then add crème fraiche and 1 1/2 tablespoons honey and beat until combined well. Spread filling evenly in shell, then top with raspberries. Heat remaining 2 tablespoons honey in a very small saucepan over moderately low heat, stirring constantly, until liquefied, then drizzle over raspberries. Serve with additional melted honey on the side. cooking time: 30mins for pastry shells. total: 1 hour & 8mins. taste: 3.5/5. Fresh & simple with a touch of luxury. I chose to add all the honey to the cream mixture (which I doubled - also used equal parts creme fraiche to cream cheese). Despite using a lavender honey I couldn't really taste the lavender, instead I would sprinkle lavender buds to increase the lavender flavour if you wish. I made four mini tarts. I did find that the crust was a little on the tough side and I had to use some force to cut into it. 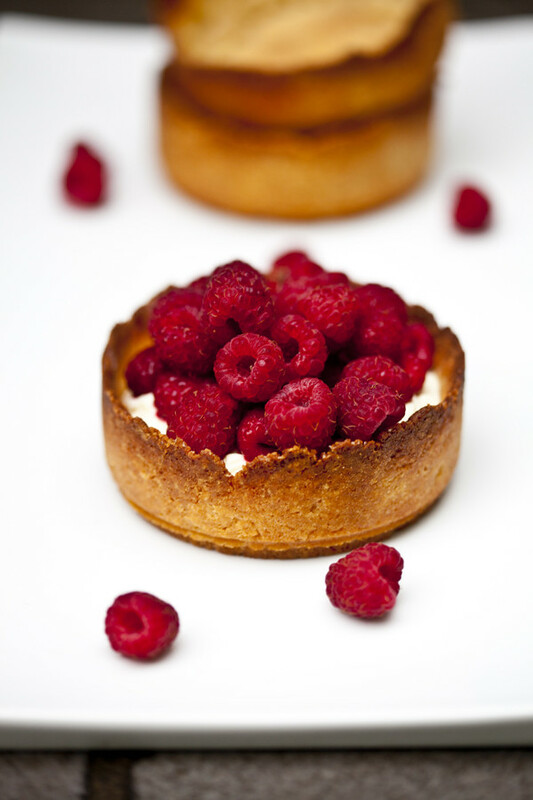 Aside from that the fresh, tart raspberries work well with the sweet, luxurious cream and buttery crust. would I make it again: No - although the flavour combo is lovely, hubby isn't a fan of tarts unless they are super amazing. What fresh and delicious tartlets! Welcome back!!! I was wondering when you would be sharing another delicious post with us. And it does look delicious. I love fresh raspberries and your photos are beautiful. It's amazing how calming life is when you aren't constantly connected, isn't it? Well, that's how I find it anyway. I hope you enjoyed your break. Looking forward to more delicious posts! Welcome back -- you were definitely missed. These look wonderful and something about mini tarts always tempts me even more than the large ones. OH and I totally know how you feel about blogging after long hiatuses. Even after a week of not checking my reader, the number of unread posts gets overwhelming (1000+). I've had to just mark everything read several times, but I can honestly say that I'm so glad I kept going. Can't wait for your weekly posts again! I love the looks of the crust! I think I'll try it....raspberries are a favorite of mine and this makes such a pretty presentation. Also, love using lavender as a flavor! Welcome back! I can't imagine getting used to a hiatus like that but it must have actually been quite refreshing! these tarts look lovely, possibly because the thought of a fresh berry is so tantalizing to me at the moment! gorgeous! YAY Spring and fresh berries! So good to have you back! Was wondering where you were. Wow! Stunning photography! This sounds and looks absolutely divine!! Wow! Beautiful Photo! I am sure the taste is even better! Welcome back. This reminds me. This year, I am making lavender honey. Yay! You're back :) I so missed you posts. It must have been a nice feeling to be technology free for a while - I bet you had a lot more time on your hands, I know I would. I am so attached to my computer & the internet. A forced break would probably be good for me though. 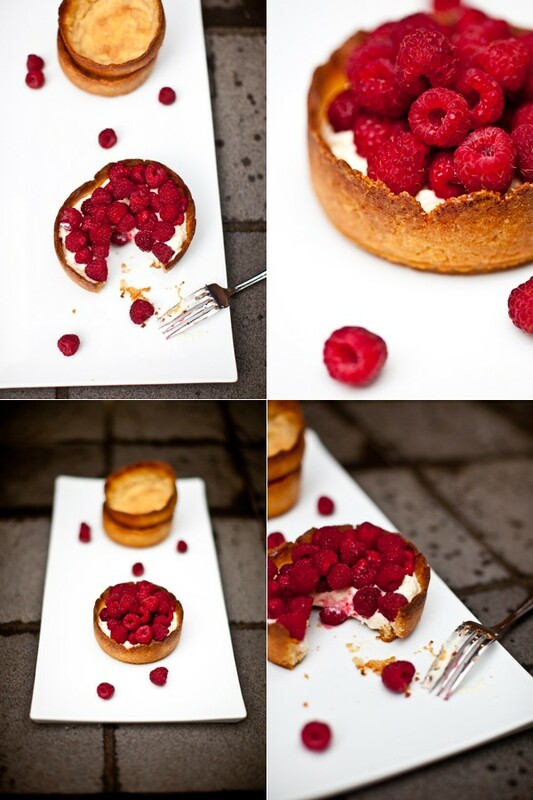 This tart looks beautiful! mmm, I adore creme fraiche. Lovely. sorry for the out-of-your-hands trouble! i know that i absolutely can't stand to be without internet--it's my one true addiction, i believe! you're back with a bang, though--this tart looks so lovely.